If you’re left with a happy hour in between shopping at the Galleria, step into Lancôme’s beauty booth at Mumbai’s Phoenix Mills. You’ll be surprised by the dramatic setting – it’s like entering your own futuristic pod. They offer a complimentary facial, which is highly recommended since Lancôme prides itself on sophisticated massage techniques. The skin experts give you a complete low down on most-benefitting application techniques, so you can finally ditch the video tutorials. Kama Ayurveda’s store at Khan Market in Delhi will transport you to an old kitchen, as the vintage aroma of Ayurveda wafts through the air. If you’re enchanted by the flurry of organic cosmetics, the jalousie shutters, ivory walls and checkered flooring will leave you feeling at home. Store assistants will help you try out rose and jasmine lotions and massage oils. The classic face mist is in its element here. A recent Monday ritual is visiting InOrbit Mall in suburban Mumbai. Not much of a joy ride, if you’re travelling from South Mumbai, but Crabtree & Evelyn’s Manicure Mondays make it worthwhile. It’s a complimentary service that includes their signature botanical manicure along with nail and cuticle therapy. As exciting, is the hand therapy they offer, with their famous hand scrubs. Experience mud packs, the famed sea salts and instant rejuvenating creams, at the Premier Dead Sea store in Raghuvanshi Mills, Mumbai. The experientials encapsulate their policy of selling you something you will use, and not reach an expiry on your beauty shelf. Don’t miss the Israeli expert’s ‘magic trick’. True to the statement, the initial hand-wash will wipe off dead skin cells, and it is no less magical. 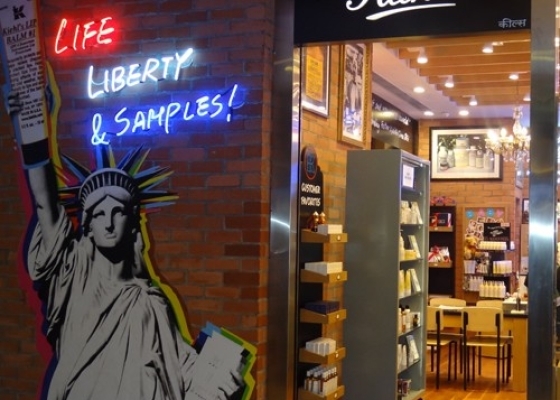 A cutout lady liberty, bare brick walls with neon lights and a skeleton named Mr. Bones greet you at the Kiehl’s store at South Mumbai’s Palladium mall. Much like the East Village in New York City, the atmosphere is a lot of jazz. A neon sign proclaims ‘Life, Liberty & Samples’. A happy signature ritual at the store is that even if you do not purchase anything, you are sent away with lots and lots of samples!